Stage noise is drastically decreased which in turn improves sound for the congregation. The band becomes ‘tighter’ because they can hear better. Each band member can have a unique mix where they are slightly louder than the rest of the band which fixes the ‘can you turn me up in the monitors’ problem. The drawback to switching is the cost involved, especially if you want to go wireless with everyone having their own personal mix. But, there is a solution for those working on a smaller budget. It may not have as much flexibility or look as pretty as the costly solutions, but it is way better than sticking with floor wedges. Although everyone shares the same monitor mix in the solution I outline below, they are still able to turn up their own instrument in their ears only over the shared mix. It is not as ‘personal’ as being able to create your own, unique mix, but at least you will be able to hear your part over the rest. First of all, you will need to split your monitor mix so you can send it to all those who will have in-ears. I recommend the Whirlwind Split 6. If you need to split more than 6 times, simply use 2 aux sends and buy two of these splitters. Then all your vocals could share one mix and the instrumentalists could share another. Step 1: Connect microphone splitter to desired monitor mix. Prior to using in-ears, you used an aux send for each monitor mix on the stage. You can use this same mix for the in-ears, but it will be routed through the Whirlwind Split 6 instead of your floor wedges. If your floor wedges are powered (have the amp built in), you can use the XLR cable that runs to the floor wedge and plug it into the splitter instead. If your floor wedges are unpowered, you will pull the XLR cable from the amp that is powering your monitors and plug it into the splitter. Otherwise, you can simply use a new aux send, if you have one available. Simply route the connection from your board, through the stage snake and then to the splitter. Step 2: Connect personal monitor amps to the mic splitter. Each Rolls Personal Monitor Amp needs to be connected to the Whirlwind Split 6 with a 1/4” to XLR female patch cable. Simply plug the 1/4” side into the ‘Monitor Input’ on the Rolls and the XLR side into the Whirlwind mic splitter. Keep in mind, the monitor mix will be in mono. So on the Rolls Personal Monitor Amp, you will need to use the mono (aka ‘mon’) selection. To do this, you will need a small tool to remove the little plastic piece and reposition it appropriately. Step 3: Connect the instrument or microphone to the personal monitor amp. The way you connect an instrument or microphone will be slightly different. Following is a description of each. Use an XLR cable to connect the microphone directly to the ‘Mic Input’ on the Rolls Personal Monitor Amp. Then use another XLR cable to connect the ‘Mic Thru’ to your mixer (most likely through the stage snake). Just think of it this way: it is like before, where you are sending the mic signal to the mixer, only the Rolls is in the middle. So, the signal simply ‘passes through’ the Rolls and then heads back to your mixer. For everything that uses a direct box (keyboards, acoustic guitars, bass guitars and guitars that go direct in), you will still need to use the direct box. Simply use a microphone cable to connect the ‘Output’ on your direct box tot he ‘Mic Input’ on the Rolls Personal Monitor Mix’. Then use another XLR cable to connect the ‘Mic Thru’ to your mixer (most likely through the stage snake). To make your bass guitar sound great, I recommend using the Tech 21 SansAmp Bass Driver DI instead of a normal direct box. Otherwise, you may struggle with it sounding thin and powerless. It is now time to connected your headphones to the Rolls Personal Monitor Amp using the 3.5mm extension cable. Now, you can use the two knobs on the front of the Rolls to control your mix. The ‘Mic Level’ is how you turn your instrument up over the mix. The ‘Monitor Level’ is how you adjust the volume of the shared monitor mix. The best way to manage the microphone cable is to create a small loop at the end of the cable and put it in your back pocket after connecting your headphones. Then the cable runs down you back leg – almost invisible! To simplify and make things better, it is a good idea to combine your guitar’s instrument cable with the 3.5mm extension cable using electrical tape. Then, there is only one cable running up to the guitar and the guitarist can plug in their headphones near the guitar input. This looks much cleaner than two separate cables running to the guitarist. 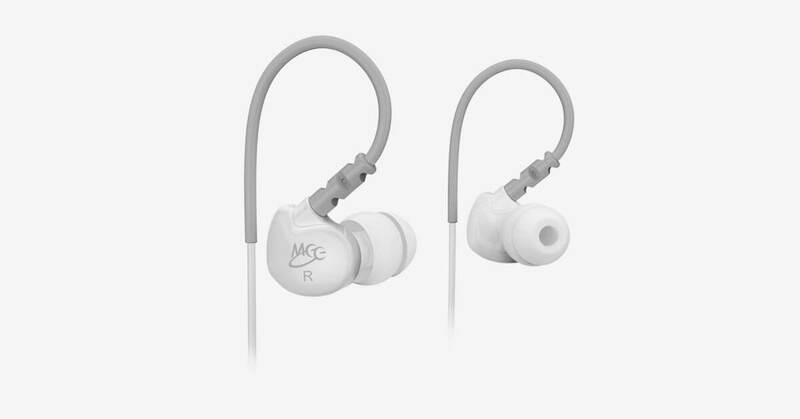 Special thanks to Brad with ChurchMediaDesign.tv for introducing me to this in-ear setup. So, what I am seeing, if you are someone who sings, AND plays an instrument, with the Rolls personal monitor amp, you will actually need TWO? Then how will you deal with the two sets of headphones one would need? They make a Rolls PM351 that you can use for mic input and instrument input. I have been using the PM351 for almost two years with no problems. I love it! It allows for independent volume control for your mic, instrument and input (monitor mix). This may be a dumb question but I’m new to the in-ears world. Does each individual box require it’s own aux send? For example, if my board were to have 6 aux sends, then I am limited to 6 individual Rolls boxes? Each Rolls box does not require its own aux send. You can share 1 aux send across multiple Rolls boxes using the Whirlwind Split 6 to split the aux send signal up to 6 times. We actually use all the mixes on the board for each personal monitor so each has their own mix. Then we control individual monitor mixes from the stage using the iPad app for the digital board. Works well if you have enough budget to have a wifi enabled board with a good amount of mixes available. This is most definitely the best option. The solution above is mainly for those using an analog board with limited aux sends. If you have a digital board, chances are you have plenty of aux sends and do not even need to use the Rolls, but just a simple headphone amp. So what is typically in the aux send for the singers or musicians? Is there any phase issues with basically having a guitar come thru headphone amp twice? The aux send can be mixed however your heart desires, but I recommend sending a good mix of everything (just like what you would have in the house mix). As far as phasing issues, if there are any, they have never been noticed by myself or anyone on my team. Here’s still another alternative if your church has a wireless “hearing assistance” system. Have each team member grab a receiver, get the MEElectronics in-ears,and they will be hearing the house mix as the congregation hears it (plus you can control your own “house” volume. You can hear how you set in the overall mix. Otherwise, the above system is an excellent suggestion for those w/o a wireless. Came across another headphone amplifier that was much cheaper but am not sure if it works well as rolls? Its BEHRINGER MICROMON MA400. Was way much cheaper than Rolls PM50S. Our church is planning to go for the switch to in ear monitoring after reading Kade’s post. Haha. Nice write up Kade. I haven’t compared the MA400 against the Rolls, but I do know the MA400 does work well for this wired IEM setup. However, I don’t believe Behringer makes a two-channel version for a singer + instrument in one box. Also, Behringer creates a headphone splitter (MicroAMP HA400 – 4 channels), that is a cheaper alternative to the Whirlwind. Hey Kade. I spoke with you a while back about this rig. I’m having another issue. I’m trying to hook up our electric drums to the Rolls PM50s. I’ve got it hooked up exactly how it was laid out here (checked several times) and I’m not getting sound from the monitor mix knob. However, the mic level knob seems to be operating as the monitor mix and turns up everything. Basically, my drummer has no way of turning himself up or down. I’ve checked with different PM50s’ and completely changed out chords but everything is working fine. Is there a different way that electric drums have to be run? Any advice would be greatly appreciated. Thanks. What’s the best way to catch feedback? I once had a singer try this system out, then had another singer point their mic at the speakers and almost blew out her ear drums. I bought a “Rock Box Limiter” but I am not sure where to put it in the chain? First step is to train your vocalists not to point their mics at the speaker. Second step is to make sure your room is properly EQ’d so feedback is less likely to happen (this post should help). Lastly, the Rock Box Limiter should be the first in line after the aux (or bus) output. So, output -> limiter -> signal splitter -> headphone amp. Hey Jorge – I am not sure if this would work or not either considering I have not tried it. Let us know what you find out! The issue here is latency, and I don’t believe there is a good way to get it low enough. An alternative (which I personally haven’t tried), is an FM transmitter. The miniamp takes a stereo input signal and splits it to run 4 separate pairs of cabled headphones: there is a separate volume knob for each pair of headphones. Connecting a Bluetooth receiver to either input ‘A’ or ‘B’ could replace hard-wiring the Aux sends from the mixing desks (if these Aux outputs could be routed through separate Bluetooth transmitters!). If you were able to get these transmitters, there would be no need for the miniamp anyway: the Bluetooth earpieces could pick-up and amplify the Aux sends i.e. replacing the wired signal path with a wireless one. What you have suggested won’t work. Note that the earpieces are optimised for speech (phones) and would be unlikely to provide a suitable music fidelity, or even volume. I’m also looking at doing personal monitors, but don’t think we are hi-tech enough for in-ear and am considering a personal monitor http://www.musiciansfriend.com/pro-audio/galaxy-audio-nspa-25w-powered-nano-spot-compact-personal-hot-spot-stage-monitor for the singers. The problem with this is the need for cords and power. I don’t know what the latency would be and what hardware to use to transmit the bluetooth signal? Anyone have suggestions? The good news is that the amount of delay/latency here IS small. If using an Analog board the AUX sends are near zero. Digital mixers which do have latency, but only to the extent that their A-D/D-A converters have latency, which is small enough to be imperceptible in most circumstances. Typically, A-D and D-A converters together delay the signal by considerably less than five milliseconds (ms), and it’s generally agreed that most people’s perceptions are not sharp enough to notice a delay of this order. It is worth noting, though, that there are situations where even a couple of milliseconds’ delay can be a problem: for instance, if you use a floor monitor rather than headphones to allow musicians to hear themselves, you usually get some spill into the mics. If that monitor is being fed from a digital mixer, you may get ‘comb filtering’ between the spill and the direct sound. Any suggestions / how-to’s on transitioning to a wireless in-ear config? I’m running with an X32 and a couple of standard floor wedges for monitors in front of the stage. It works ok and I have it tweaked about as good as it’s gonna get, but with 5 singers wanting a different sound from the wedges for every song it becomes a compromise game. We’re wireless across the board due to some building challenges so any advice on how to (reasonably $-wise) add in a half-dozen wireless in-ear monitors would be awesomesauce. Thanks! Hey Lee.. I am running the exact same set up and i found a GREAT solution. I actually just ordered two more because I was so pleased with the combo. I am running my P16’s into these Audio 2000’s wireless packs.. im running 2 right now and have no issues for 3-4 months. Clarity is great, distance is awesome build quality is OK, not metal construction, but doesn’t feel like its total trash either. I would not think twice about picking up more of these. Question: I see that wireless IEM’s, like the Shure PSM systems have a built in limiter so that when there are pops (from instrumentalists unplug without muting) and feedback from mics, it doesn’t destroy your ears. Do you know if any wired boxes have a limiter built into it? Hey Al – The headphone amp mentioned in this post does not have a built-in limiter, although that would be a handy feature. If you are running a digital board there is a way easier and better solution. Get some little mixers or headphone amps (we use the Behringer Xenyx 502 Mixer). Send separate mixes to the stage and into the mixers. Headphone out of the mixer and everyone has their own mix, 2 band eq, and master volume. The best way to run in-ears in a budget. I mix each channel in an iPad from the stage via our Yamaha LS9. On newer boards everyone can mix in their own smart device. Great tip, Aaron. I’d have to agree. The solution outlined in this post is geared towards those with an analog mixer.